Logan Lake is only 16 hectares and rests at an elevation of 1100 metres. The park is on the main highway of the community and is hard to miss. The park includes picnic tables, BBQ pits, washrooms, viewing benches, a loop hiking/walking trail, a water fountain, a swimming pier, and a playground. The short "Nature Trail" starting from Maggs Park circles the small lake. Some portions of the walking trail follows along a paved walkway while other segments of the trail follows a pine-needle cushioned path through the forest. People who visit Maggs Park in the summer enjoy birdwatching, hiking, canoeing, picnicking, boating, swimming and fishing. In the winter months the lake is frozen over and becomes a skating rink while the trail converts to a short cross country ski circuit. 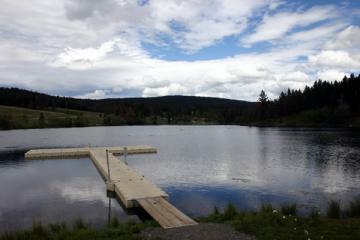 There is also a very small municipal campground at one end of the lake opposite Maggs Park which is open in the summer. How to Get Here: Travel to the community of Logan Lake via Highway 97C. Once in the community you cannot miss the park.